You get the Rhythmbox music player is out of the box in Ubuntu and just about every other GNOME-based distro, so this is a good place to start. Rhythmbox was inspired by Apple's iTunes app. But thanks to a robust plug-in system, Rhythmbox is actually capable of much more than Apple's jukebox software. 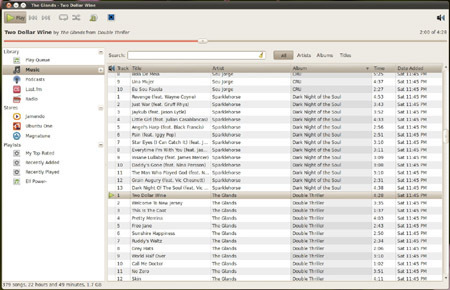 Rhythmbox is the default music app for most GNOME users for good reason – it has all of iTunes features such as smart playlists, iPod integration, and several online music stores. You can search for, buy and download music and sync it to your iPod with a few clicks of the mouse. It's the Ubuntu Music Store feature in Rhythmbox that's gotten a lot of attention with the release of 10.04. Why? If you frequently buy digital music through iTunes you can pick up right where you left off with Rhythmbox. While the Ubuntu One store isn't quite as well-stocked as Apple's, it makes an acceptable replacement. Rhythmbox also supports the Magnatune and Jamendo services. So it replaces iTunes. Is that it? Hardly. Rhythmbox has dozens of extras. It integrates with Last.fm. It can tune in to internet radio streams, grab song lyrics, update your IM status, and much more. If you're coming from Windows and looking for something to replace iTunes, Rhythmbox is probably your best bet. Rhythmbox makes a good, all-around music player with all the features most users are likely to want wrapped in a fairly simple interface. On the downside, Rhythmbox can be slow on older hardware, lacks customization options compared to other players, and might be more than some people need.